While this Bell helmet may not qualify you to keep up with Marquez it certainly qualifies to be a solid lid. 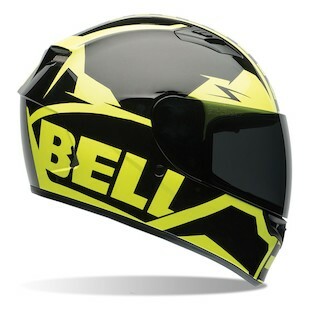 This new helmet from Bell has 3 unique polycarb shell sizes, weighs in around 3.5 pounds in a size medium, and shares a lot of the same technologies as it’s relatives (RS-1, Vortex, Star). If you are a fan of the transitions shields well look no further as this Bell helmet is qualified to accept Bell’s Transitions SolFX Photochromic Face Shield. Oh, what was that? Another “qualified” joke you ask? Yeah, I will probably throw in a few more. 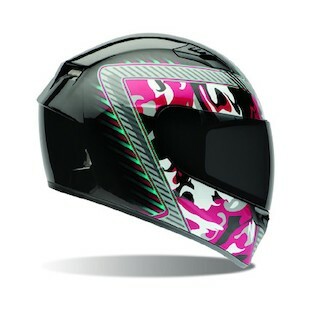 Bell Qualifier Airtrix Battle Helmet: If you are looking to add some pizzaz to your riding gear you will probably like the new Bell Qualifier Airtrix Icon Graphic. The Airtrix Icon does a great job of incorporating the timeless checker flag with the classic skull and crossbones. You never know, this graphic may have you doing some trix in the air. Yeah, that one was a bit of a stretch but we’re just going to roll with it. Bell Qualifier Momentum Helmet: The new Momentum graphic from Bell is a great combination of Hi-Viz without being Mr. Safety Steve. Hi-Viz is never harmful to have while you are out there battling with those 4-wheeled cages but sometimes we like to have some style with our gear too. The Momentum graphic is a great combination of style and added visibility. Bell Qualifier Camo Helmet: If the totally wild and eye-catching is more your style, the Camo Qualifier from Bell is going to be something to behold. This graphic is totally bonkers. Like a vision from an electric dream, the Pinks, Purples, Greys, and Greens come together in a smorgasbord of action that is certain to keep heads turning as you ride by. The Qualifier is a great entry-level helmet and it’s going to be a tough helmet to beat at that price point. This helmet has a lot of great graphics to choose from, it is lightweight, and shares a lot of the same features as the more premium models. If you are new to the motorcycle scene or you are simply looking for a great passenger helmet without spending a fortune, this Bell helmet is more than qualified for the task.